My photos from a walk along Langosta Beach have heretofore featured broad views of the surf and waves, so I will do something different during the next week. I often overlook details, unlike my wife who excels in macro shots. So, I will try to show a few of the details of the beach scene, beginning with this shot of a curving crevice in the sandstone rock that apparently captures and retains the tide water, providing an attractive habitat for some crabs in this ribbon of shells. Walking to the south along Langosta Beach brings us to the spot where the Langosta Estuary empties into the ocean. 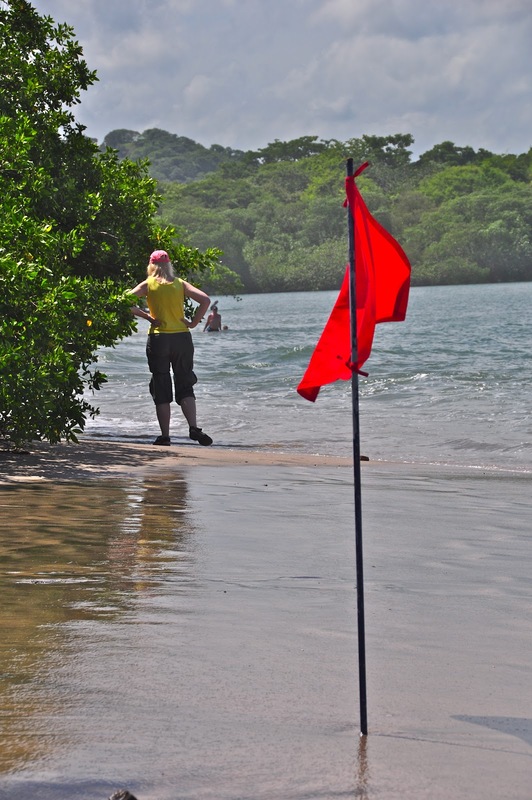 The lifeguards at the Barcelo Langosta Resort have put up a red warning flag, although there is a swimmer in the mouth of the estuary in the distance who has ignored the warning. Julie is surveying the scene, and will soon turn around. At low tide it is easy to walk across the estuary mouth and continue walking for miles along the beach. At high tide, however, it is best to turn around, as the walk along the shore up into the estuary will soon be blocked by mangrove thickets. This is a view from the beach where our condo is located to the south, with the relentless onslaught of waves massaging the beach. This is one of those spots where it makes sense to walk around the point in between the waves, although there are paths up through the barrier of trees. 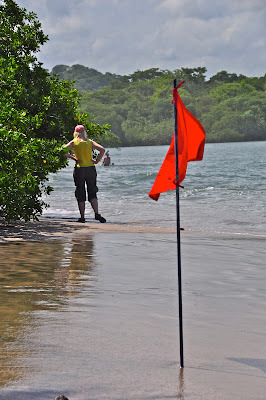 In Costa Rica, all beaches are public property from the high tide mark and for 50 meters inland. Unless property was grandfathered by being recorded on property records before a law that was passed in the 1970's, it is illegal to build within 200 meters of the high tide mark. Our condo is within that zone. Today is Sunday, so we have new photos posted on our Viva la Voyage travel photo site. This week we are showing photos of the Colorado River at the bottom of the Grand Canyon, including a photo of an endangered species, the chubb. I took this photo with the telephoto lens zoomed down to the point south of our condo on Langosta beach. We like the solitude of being alone with the waves, sand, trees and sky. Tomorrow I will show the view in the other direction at high tide. We have photos of the colorful architecture and street scenes of Grenada, Nicaragua, posted on our Viva la Voyage travel photo site this week. 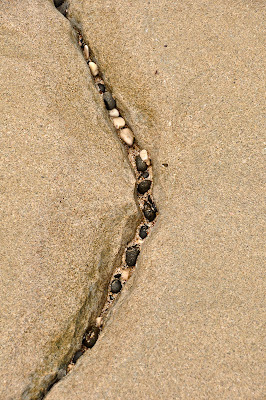 Rather than looking up the beach, let's zoom in for a straight on view of a crashing wave. I don't know what it is, but we never tire of the ocean. This is high tide on Langosta beach, with the foam from the waves nearly covering the sand. There is still room to walk down the beach, even at high tide, but there are a couple of spots where we time our walk to coincide with the gap between waves. This is a view north up Langosta Beach. Tomorrow's photo will reveal whether this photo was taken at high tide or low tide. I think this surfer must be contemplating, "Shall I go out for more?" He is standing along the edge of the mouth of the Langosta estuary. This is high tide, as the estuary is wide. You can wade across it at low tide, and walk for miles on the beach on the other side. But at high tide it is can be a challenge. Usually I show surfers, dogs, birds, children, fishermen, or other sights along the beach. Even when no one is around, which is often on quiet Langosta Beach, there is always something to see. The waves, ocean breeze and roar of the surf are as relentless as the rush hour traffic and the ringing of the phone and tone of incoming emails at work back home in the USA. I took this photo on the beach just below our Langosta condo. Julie and I have a USA phone in our condo, and of course we are connected to the office by internet. But it is nice to take a little break from work and walk on the beach when time permits. The flock of pelicans I showed yesterday bunched up a bit from the long line in yesterday's photo, so I cropped this little tighter view. I had only my 200 mm lens this day. I will need to borrow Julie's 300 mm lens and spend more time at the beach on our next trip down to Tamarindo to enjoy one of our condos down there. Today is Sunday, so we have new photos posted on our Viva la Voyage travel photo site. This week we are showing photos of colorful architecture and street scenes of Grenada, Nicaragua. We enjoy watching the pelicans fly by our Langosta condo. They seem to use the beach as an aerial highway, as we see them flying up and down the beach often, but rarely see them inland, nor farther out to sea. Sometimes they fly high, and other times, like this group, they fly at low altitude along the top of the breaking waves. I suppose this gives them a view of fish to dive down to catch. We have photos of the wildlife of Africa posted on our Viva la Voyage travel photo site this week. 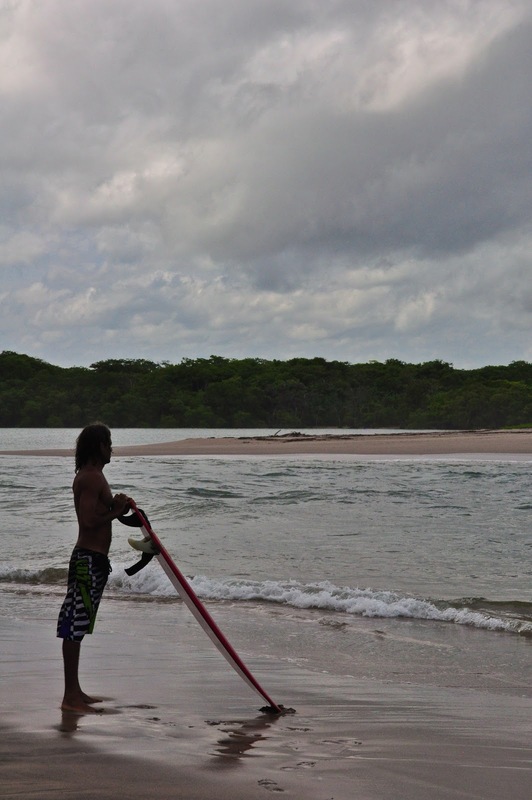 In addition to surfers, there are sometimes fishermen on Langosta Beach. I don't understand how people can fish without a pole or a net, but these men are doing it. I would think the waves would just cause the line to roll around on the sand, but I guess there must be a chance that the waves carry the line out to deeper water where the fish are. I have shown a number of surfers lately on Langosta Beach. I am not the only one who likes to watch what is going on at the beach. As you can see form this photo, there are others hanging out at the beach. Most of these people are probably guests of the Barcelo Langosta Beach Resort, which is very close to our Langosta beach condo. In the days ahead I will show a few photos of other scenes, besides surfers, that can be seen along the beach. All good waves must come to an end. When this wave broke, the surfer found himself airborne in a shower of ocean spray. Langosta Beach maintains its International Blue Flag certification for clean water. If you're going to be in this much contact with the water, it should be clean. Costa Rica takes the cleanliness of its water seriously. Several years ago environmental authorities shut down a new Spanish-owned hotel in the middle of the tourist season because they discovered that one of the buildings was not hooked up to its sewage treatment system. The several hundred evicted guests did not complain about the government's action because they realized it was the right thing to do, even if they were inconvenienced. This surfer looks to have good form. Do you think there is a wipe out in his future? Is the sky blue? 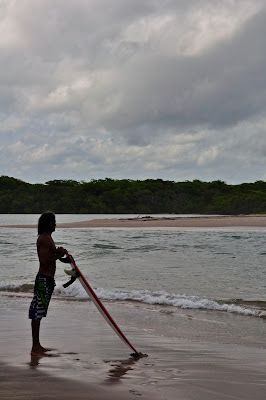 I think I will show a few more photos of the surfers enjoying Langosta beach right by our condo. Langosta attracts some excellent surfers. The dog resting. And posing. After the vigorous workout fetching the stick, the dog was ready to rest in the shade of the trees along the beach and to cool off in the nice ocean breeze. He also seemed to be quite confident posing for me. Today is Sunday, so we have new photos posted on our Viva la Voyage travel photo site. This week we are showing some more photos of the wildlife of Africa. This dog seemed to know that he was the center of attention. He paused to reposition the way he was bringing back the stick, and perhaps to get a glance behind time to check on his admirers. I will conclude this series tomorrow. A comment about efforts to increase tourism from China. There was an article in the Tico Times this week about the Costa Rican tourism authorities' efforts to increase tourism from China by having an exhibit in a big tourism exposition in China this week. There are 1.1 million Chinese who visit the USA annually, 243,000 who visit Canada, but only 10,000 Chinese visit Central America. Those figures suggest that there is certainly the potential for a lot more tourism from China to Costa Rica. We have photos of Jerash, Jordan posted on our Viva la Voyage travel photo site this week. It is the largest excavated Roman city outside of Italy. The dog I have shown during the last few days was so exuberant in chasing a stick and was running so fast that he overran the stick and had to pivot and change directions. The dog was calm when returning the stick, as I showed yesterday, but when his owner tossed the stick for the dog to fetch, he was a fluffy flash in joyful concentration to reach the stick as fast as possible. This little dog caught my eye because he was so playful and was clearly enjoying himself on Langosta beach. It was a breezy day, so his long, fluffy hair was blowing as he ran around fetching a stick, as I will show during the next few days. Wipe Out: There is a body in there somewhere. The next stage of the surfer's wipe out shows a body tumbling in the crashing wave. I can recognize an arm and hand flying above the wave, but I can't make out where the rest of his body is. The surfer that I showed yesterday pointed his surfboard too high into the wave, and I caught this photo just as he was about to go airborne. Of course, he would probably say that he meant to do this. He perhaps was tired of riding that wave and wanted to cut short the ride and head back out for a better wave. Tomorrow I will show the next stage of this wipe out. I have shown some photos recently of a surf shop, and photos of surfboards being pulled by a bicycle trailer on the main street in town, so it is probably time to show some more real surfers. How do you think this surfer will do? Will he ride this wave to shore or wipe out? The answer, as ususal, will be shown tomorrow. Today is Sunday, so we have new photos posted on our Viva la Voyage travel photo site. This week we are showing photos of Jerash, Jordan, which is the largest excavated Roman city outside of Italy. The bicyclist seemed to do just fine pulling a trailer loaded with surf boards through the main intersection in the middle of Tamarindo. He is leaving the beach front road, so my guess is that these are the surf boards from a lesson given at the beach, and he is returning the boards to a surf shop, so the customers do not have to carry the boards back. It must be cheaper for the surf shop to have someone deliver the boards to and from the beach than to pay the higher rent for a beach front location. This week we are showing photos of the Church of the Holy Seplulchre in Jerusalem on our Viva la Voyage travel photo site. This is somewhat of an odd shot, (taken through the car window while driving). It is a bicycle pulling a trailer loaded with surfboards. I guess if you have s surf shop business and you need to get the boards from point A to point B, or maybe you need to borrow some boards from another shop, here is the answer to your transportation needs. It looks like he is dragging one strap that is supposed to be securing the surfboards. Let's hope they don't take a spill when rounding a corner. I don't patronize night clubs. I therefore cannot give you a review of the night clubs in Tamarindo. 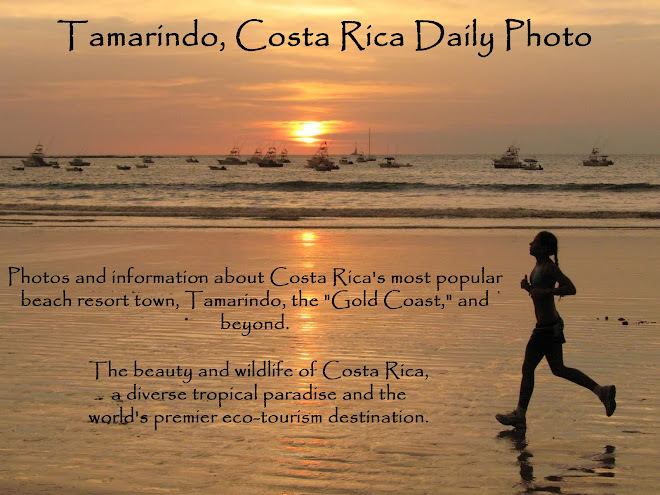 Tamarindo is the only town in the area with enough tourists to have a lot of restaurants and a few night clubs. Every once in a while, I see young women, who before they came apparently read in guide books about night clubs in Tamarindo, walking around at night in high heel and little black dresses. It looks ridiculous, as most of the streets are not paved, and everyone else is in t-shirts and shorts in the casual atmosphere of a Costa Rican beach town. This is a closer view of the accordion player who I showed in yesterday's photo. After some of the comments yesterday expressing concern about whether the musicians make it difficult to talk, I should add that the musicians walk around from restaurant to restaurant, so they stay for a few songs at each restaurant. The accordion has apparently dropped off in popularity since the middle of the 20th Century, as it used to be common for children to take accordion lessons. This is another view of the musicians who stroll around to restaurants in Tamarindo. I think that the trumpet player is wise to stay in the back of the group, as it would be harder to carry on a conversation with a horn only few feet away. Tomorrow I will conclude this little series from the Coconut Restaurant. The worldwide Daily Photo theme for today is "Pedestrians." Here is a uniquely Costa Rican interpretation of the theme -- monkeys as pedestrians crossing the street! I took this photo only one block from our Langosta beach condo. This is the main road that runs along the beach. Although howler monkeys are common in Costa Rica, it is very rare to see them as pedestrians. This is the only time that I have seen howler monkeys on the ground rather than up in the trees. The reason this mother and child were on the road is that she could not leap from the tree branches across the road, and the rest of her pack had gone from one side of the road to the other. This demonstrates why it is important to keep trees in the community even as there is more development in order to maintain the habitat and paths of travel for the monkeys. To see how other City Daily Photo bloggers have interpreted the theme of Pedestrians Crossing, please click on this link.